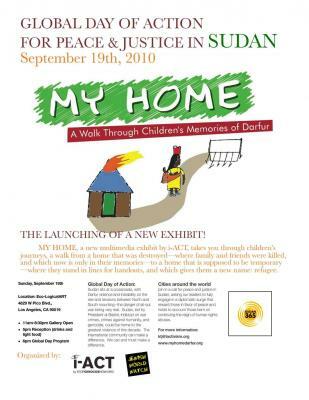 The launch of i-ACT’s new exhibit, MY HOME: A Walk Through Children’s Memor ies of Darfur on September 19th, Global Day of Action for peace in Sudan, was a success! Check out videos, photos and reflections from the event on the SGN Blog. MY HOME has been requested in cities across the United States. We are working with leaders in Honolulu, Fargo, Redding, and Atlanta to bring the voices of Darfuri children to them. Are you interested in bringing MY HOME to your community? Contact Katie-Jay at ktj[at]stopgenocidenow.org to get started. You can also download this Gallery Proposal which will help you look for a location for the exhibit. a very good article! Very informative and well written. I’ve been looking for this all of the site. out. I look forward to your articles more time in the future. Wonderful post. I learn todays truck owner on different blogseveryday. Helpful stimulating you just read content from other writers and be shown a little something through. I want to apply certain for this content on my blog if you forget to mind. Natually Ill make a link time for your web site. Thanks for sharing.